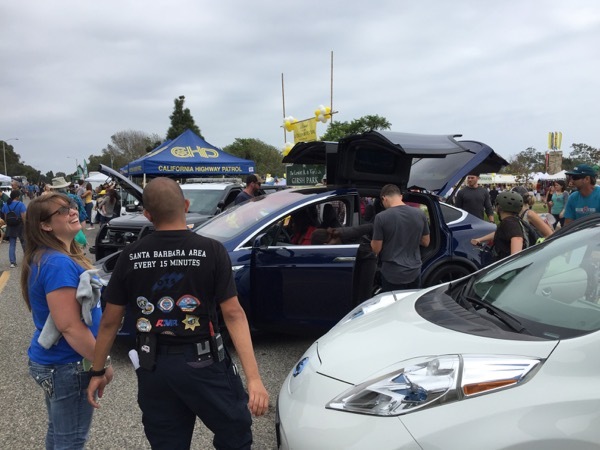 Hundreds of California Lemon Festival attendees passed through the electric vehicle car show during our National Drive Electric Week celebration in Goleta at the 2017 California Lemon Festival. At least 75 festival-goers stopped to talk with the local EV owners who displayed their cars at the event, including Santa Barbara City Councilmember and proud Nissan LEAF owner Jason Dominguez. Staff from Community Environmental Council and the Santa Barbara County Air Pollution Control District shared information about rebates and incentives for plug-in electric vehicles. Joel Levin, the Executive Director of Plug-in America, also joined us to share information about their organization and the benefits of cleaner plug-in electric vehicles. Join us on Sunday, September 17th, from 10:00am to 3:00pm at the California Lemon Festival for our 2017 Goodland Drives Electric Car Show, a celebration of National Drive Electric Week! See a wide variety of the latest electric vehicles (EV) on display, and talk with local electric vehicle (EV) owners who will share how driving electric is feasible, economical, and part of their everyday life. If you are an EV owner, register and bring your car to the event! This is a special opportunity to inspire more people to make the transition into EVs. Come share your first-hand experience and knowledge about EVs with others, and have a direct positive impact that will help our region move towards a clean future for transportation. There will be great community, and lots of fun attractions to enjoy at the California Lemon Festival. At 1:00pm, find out how you can access the numerous incentives that are currently available for new EV buyers, including the Federal EV tax credit, clean vehicle rebates from the State of California, and local incentives from Southern California Edison and the Ventura County Air Pollution Control District. We will also do some EV myth busting, to reveal the real financial and environmental advantages of driving an EVs. This National Drive Electric Week event is presented by Plug In America, the Sierra Club and the Electric Auto Association. Local sponsors include the Community Environmental Council, Santa Barbara County Air Pollution Control District, Los Padres Chapter of the Sierra Club, and the California Lemon Festival. For more information about the California Lemon Festival, go to https://www.lemonfestival.com/. Registered attendees report 175,703 electric miles driven.